The calendar may have been around since the days of the Egyptians, but calendaring software has yet to be perfected. Pdashes.com is the latest to try its hand at improving the mobile calendaring experience with its $3 aBetterCal for the iPhone. 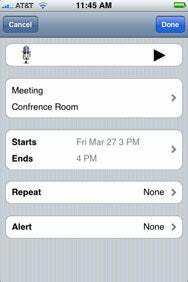 It’s A Date: Like the built-in calendar app, aBetterCal lets you set the time, date, and location of an event, but it offers added functionality like integration with Google Calendar and Voice Notes recording. If you’re familiar with the iPhone’s built-in calendar, you’ll be right at home with aBetterCal. The button layout is even similar, as it retains the basic functionality of the iPhone’s calendar. For the most part, aBetterCal functions as advertised. However, this was not always the case. Upon its first release, aBetterCal was subject to major flaws and did not function. With an update, it now operates fine, so early adopters who gave up on the app may want to give it a second look. While it had a rocky road, aBetterCal has become a viable solution for anybody who wants a native iPhone interface with Google calendar. aBetterCal is compatible with any iPhone running the iPhone 2.2 software update.